They're here! After waiting anxiously for 3 days, my MAC x Giambattista Valli order finally hit my mailbox yesterday. Meet Charlotte (left), Tats (centre) and Eugenie (right), the ladies that immediately caught my eye as soon as the campaign pictures were launched. I couldn't not write a review about it, so here we are! Click below to see it all. For his collaboration with MAC, Giambattista Valli decided to step away from the iconic black packaging. The lipstick tubes are in the same color as the lipsticks themselves, which makes it super easy to find the color you're looking for. I personally think it's a nice change and it adds a pop of color to my MAC collection. The girls in all their glory. When I received the lipsticks, they had spots on them. You can see it the best on the pink lipstick on the left -- even though I also dropped it before taking that picture. Typical. I'm not sure what the spots are. Maybe they passed the quality test when they shouldn't have or the warm weather affected the lipsticks during their way over here. It didn't affect the quality (thank God! ), but it's not that photogenic, hehe. 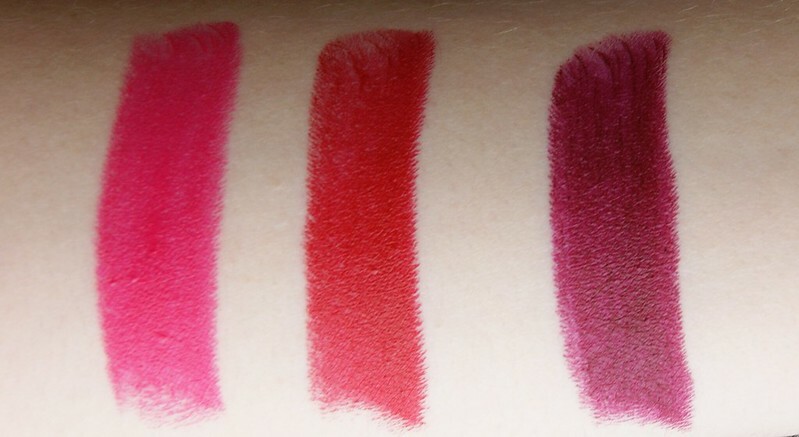 And then you also have the swatches: Tats - Charlotte - Eugenie. They're supposed to be matte lipsticks and even though they look like that in the swatches, some of them have a more satin finish. I also read it online, afterwards. Kind of a bummer for me, personally, because I definitely noticed the satin finish when I was trying the lipsticks on my lips. The first lipstick that I put to the test is Tats, a hot pink lipstick. Can you see the spot(s) that I mean in the top left picture? Tats has a more satin finish, which turns kinda matte when you blot your lips with some paper. 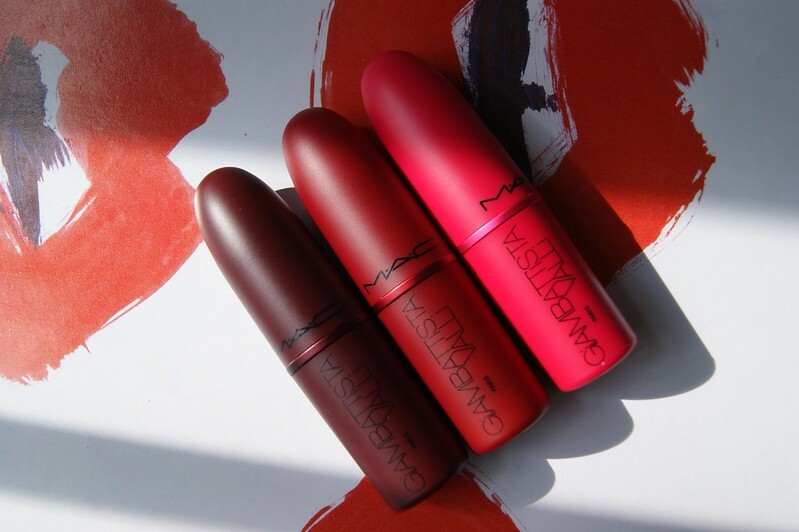 However, because of the satin finish, the lipstick doesn't cover equally that well. It will leave spots on your lips, which you can see in the bottom picture. I'd suggest to find a matching lip pencil, to completely color your lips with the pencil and to use the lipstick on top. Charlotte is a classic red lipstick and my favorite of all three. It's also the most matte one. It applies easily, it gives full coverage and the color is to die for. 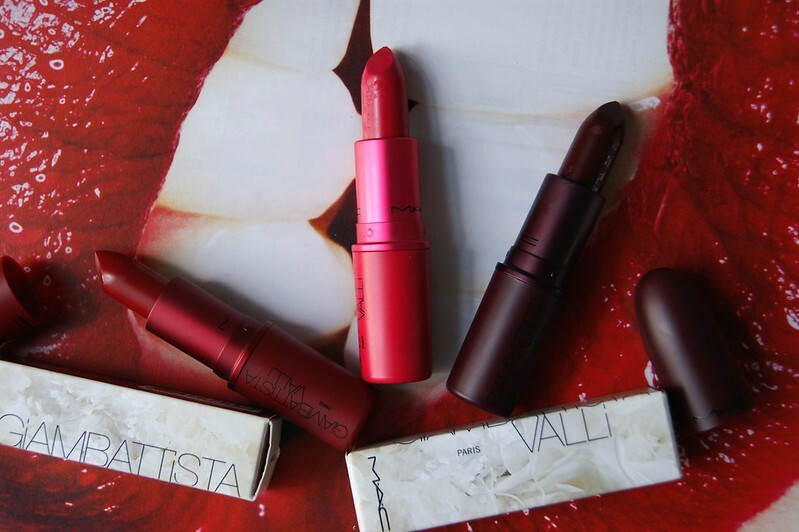 You can never go wrong with these kind of lipsticks. This one is definitely worth the investment. And last but not least we have Eugenie, a dark red / burgundy kinda color. Just like Tats, it's only matte when you blot your lips. This one also gives uneven coverage. I also would suggest using a lip pencil first with this lipstick. 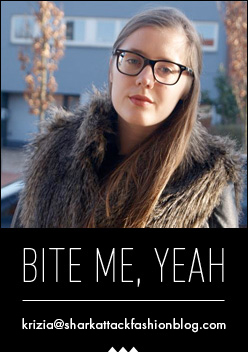 Also, make sure to scrub your lips before using Eugenie. 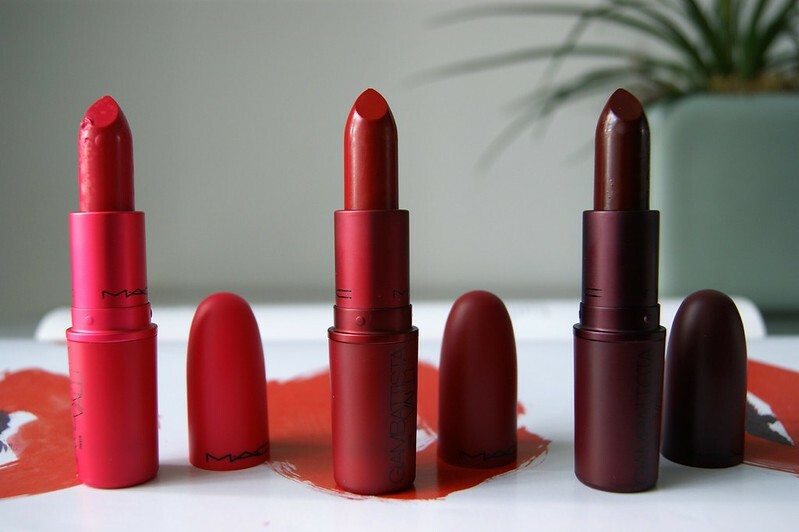 These kind of colors will show the dead skin on your lips like no other. I do love the color though; it's perfect during wintertime. The packaging and colors are amazing, without a doubt. However... I'm kinda bummed that the MAC x Giambattista Valli collection was announced as an all matte collection, when some of the lipsticks clearly have a more satin finish. It could have saved me a dime or two. On the other hand: the colors are classics that will always stay, so I'll see it as an investment this time. My favorite is, without a doubt, Charlotte. The MAC x Giambattista Valli collection will hit stores on 14 September in Belgium. Wow vooral hot pink vind ik erg mooi! Had je ze online besteld? Ja, online waren ze eerder verkrijgbaar. Waauw alledrie mooie kleuren! 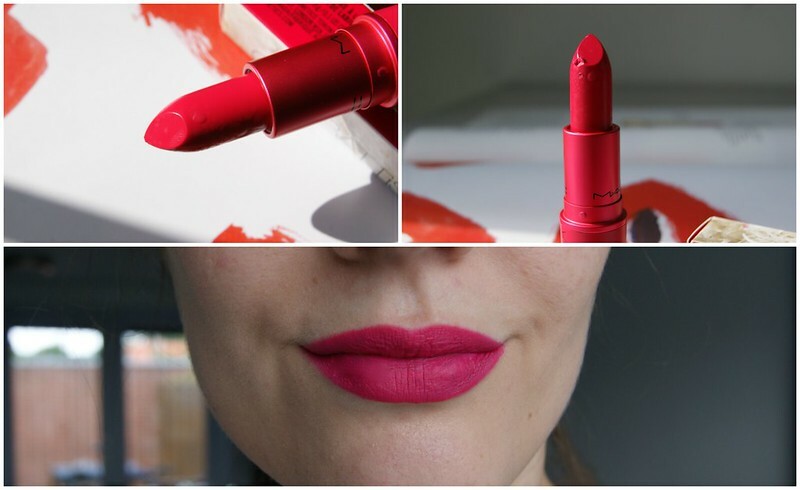 :D Moet dringend eens een lipstick van MAC gaan kopen! Beautiful colors! Must-haves! I am actually looking for a lipstick right now so this was helpful, thanks ! The finish is more satin then matte, but the colours are great! I know! It's a bummer, but the colors make up for it. Die donkere kleur is mooi zeg, zo vampy! Ja hé? Perfect voor de herfst en winter! I love all of them, but Eugenie is my favorite~!! I agree, it's a gorgeous shade! Aww thank you, you're so sweet! the dark one is so amazing! 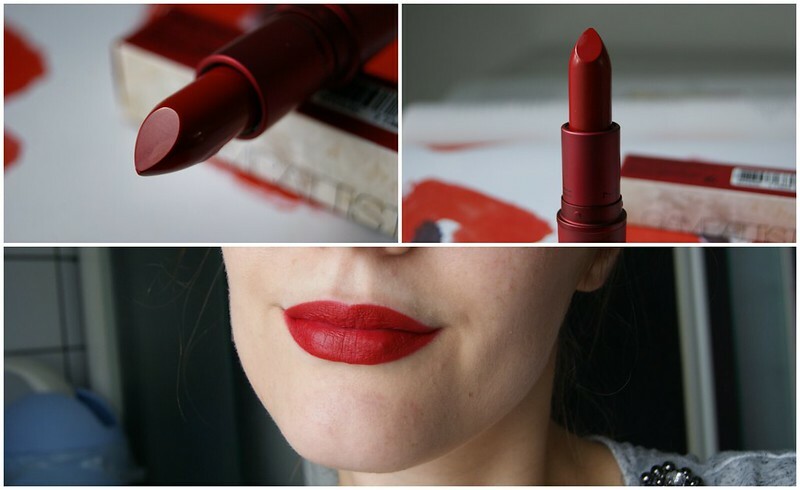 Krizia, a tip to make any lipstick matte: just dust some matte fixing powder on your lipstick after applying it and voilà - matte lips! This also helps keep it in place. 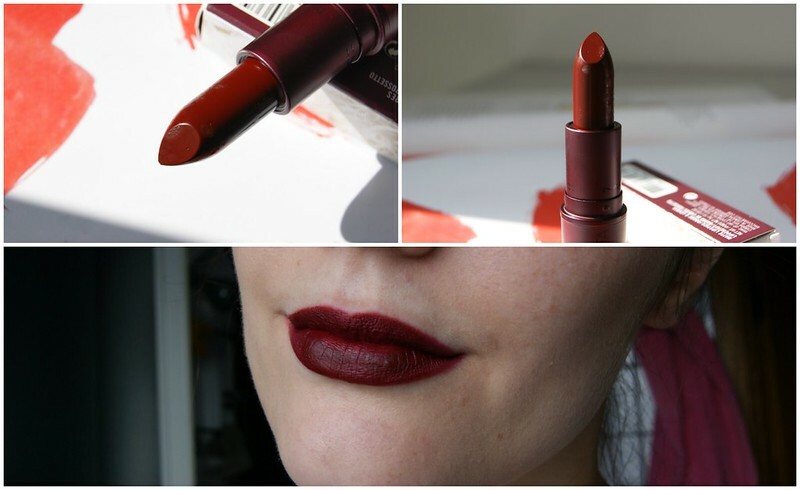 I used this technique at Graspop and it kept my dark red lipstick in place from noon till midnight without staining! AND without having to do any touch-ups! Hi Ann, thanks for the tip! I want Eugenie so bad! I hope you'll get your hands on it! I agree! Perfect for fall and winter. Staan je alledrie goed! Ik heb 2 kleuren ook al eerder besteld, ben benieuwd hoe ze mij staan!